Saint Isaac's Cathedral or Isaakievskiy Sobor in Saint Petersburg, Russia is the largest Russian Orthodox cathedral (sobor) in the city. It is dedicated to Saint Isaac of Dalmatia, a patron saint of Peter the Great, who had been born on the feast day of that saint. The cathedral's bronze doors are covered in reliefs, patterned after the celebrated doors of the Battistero di San Giovanni in Florence, designed by Lorenzo Ghiberti. Suspended underneath the peak of the dome is a sculpted dove representing the Holy Spirit. Internal features such as columns, pilasters, floor, and statue of Montferrand are composed of multicolored granites and marbles gathered from all parts of Russia. 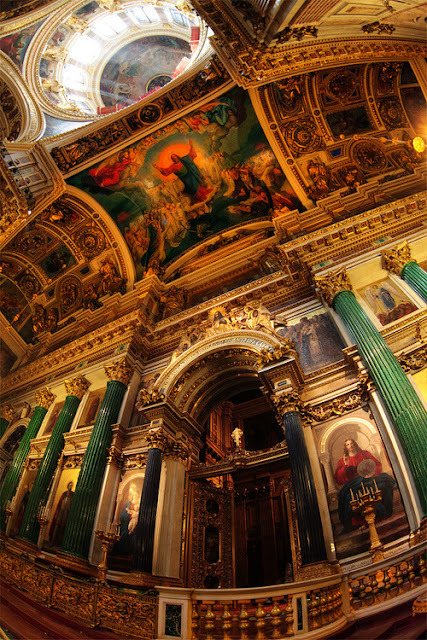 The iconostasis is framed by eight columns of semiprecious stone: six of malachite and two smaller ones of lazurite. The four pediments are also richly sculpted.